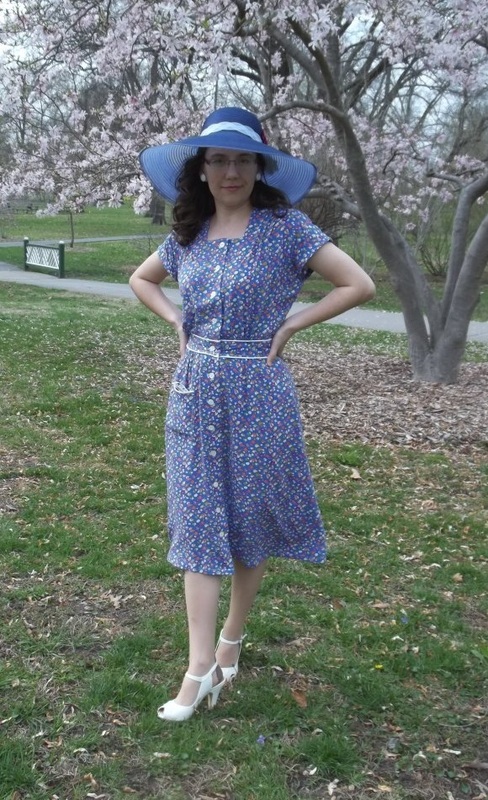 1944, Piped, in Periwinkle…My Easter Dress! 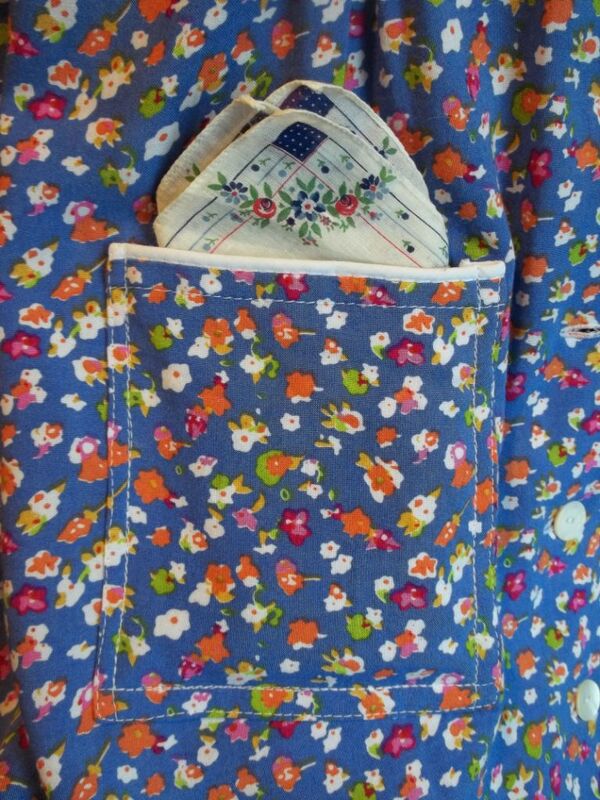 Oh, and I can’t forget, there is another “P” to my dress – a pocket! Oh boy did I wear some rich and vibrant colors for Easter this year to brighten up my spring, although I had the new grass and magnolia trees for competition! Pop goes the Periwinkle…and the orange, and the white, and the fuchsia! 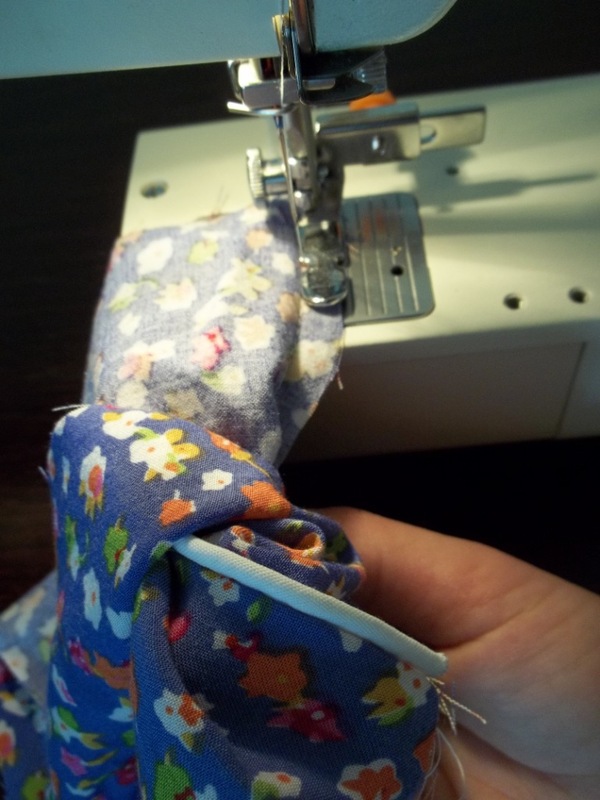 There were a number of sewing “firsts” for me when making my Easter dress. 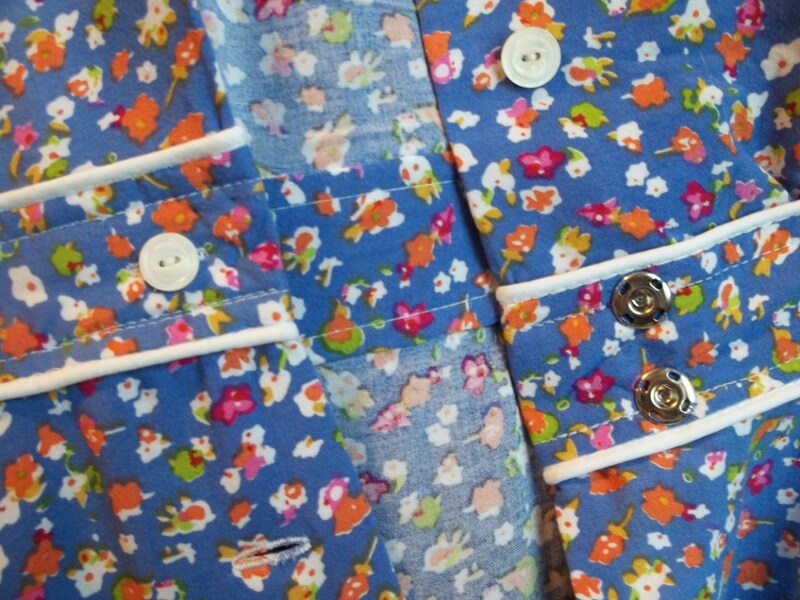 I had fun with adding a “baker’s dozen” worth of vintage shell buttons all the long way down the front. 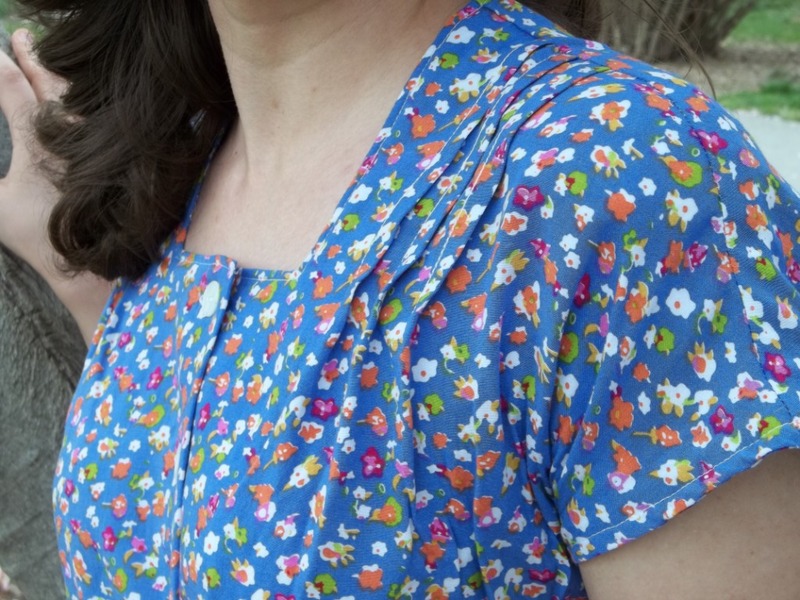 To date in my sewing, this dress has the most buttons used and button holes made on a garment. My Easter dress also is my very first full button front dress. This was even my first try, and a successful one at that, doing piping to “accentuate the positive” to the pattern design, dating to 1944. FABRIC: a 100% rayon challis, bought at Hancock Fabrics as one of their new spring offerings. It reminds me so much of the fabric drawn on the dress of the lady on the left of the pattern front. 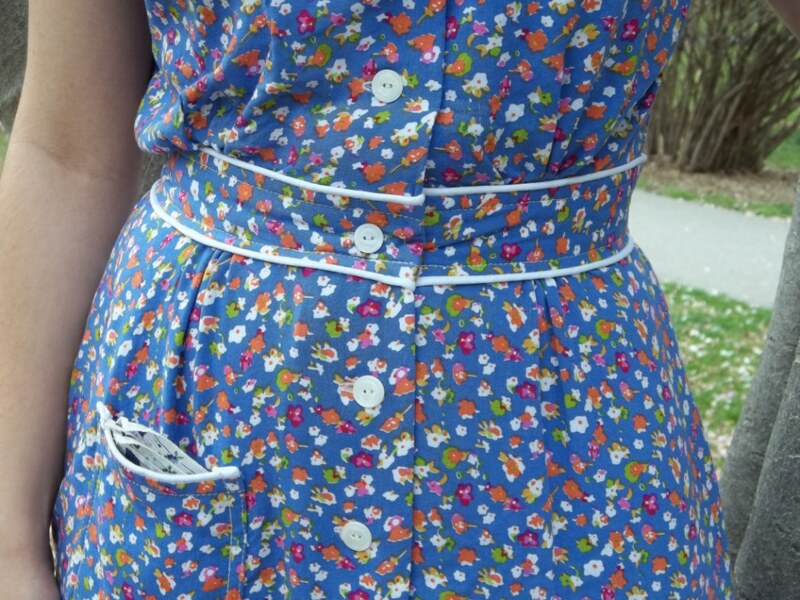 NOTIONS: I bought most of what was needed for this dress – fabric, thread, and the piping. The interfacing and the shoulder pads were on hand already. The buttons came from hubby’s Grandmother’s stash, which I now have. They are slightly heavy carved shell buttons with a glazed shiny top. TIME TO COMPLETE: Not too long but longer than “normal” for me, maybe 20 hours. It was finished on March 31, 2015. THE INSIDES: So nice…I love them this way! On account of an addition which was purely my idea, the waist band is covered smoothly inside with a second waistband cut out made to be an inner “facing” piece. Every other seam, except for the hems of course, is in French seams. The extra time spent on these finishes is so worth it when you see the insides putting it on. As much as I like this dress as a project, I really still am not sure how much I like it actually on myself, but I think this is merely because it is a new style. I’m not accustomed to having my waist so accentuated (with the piping in the waistband), but you know your waist is traditionally regarded as one of your shape’s best assets. After all, there is the famous song “Ac-cen-tchu-ate the Positive” which was published and recorded in the same year as my dress – 1944. So, I might as well follow those words and highlight my shape and the pattern’s style in one move! However much I like the dress on me, one of the major selling points to make this dress so very special is the fact that it is (as far as I know) my only local vintage pattern which has actually stayed in town the past 70 years. Through an old receipt found inside the envelope of pattern, I can see the original place of first purchase in town and narrow down the year of purchase by a note written on the back. Then I happened to find and buy it about 10 miles away from the store on the receipt…talk about localized! I can’t do this exact sourcing with any other pattern in my stock. Dissemination of patterns through online sellers, vendors, and such seem to me to make sure that many patterns do not stay where they came from. 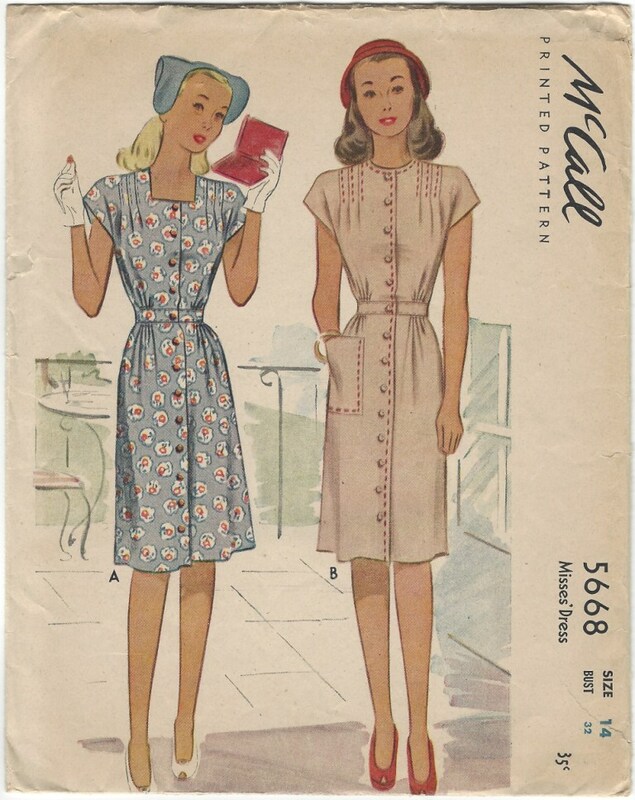 After having so much enjoyment finding this 1944 McCall #5668, I now feel that this fact is rather a sad necessity for getting old patterns bought and sold. Happily my research into the pattern’s history through the receipt helped me discover something new about my own city and about the turnaround of old patterns. 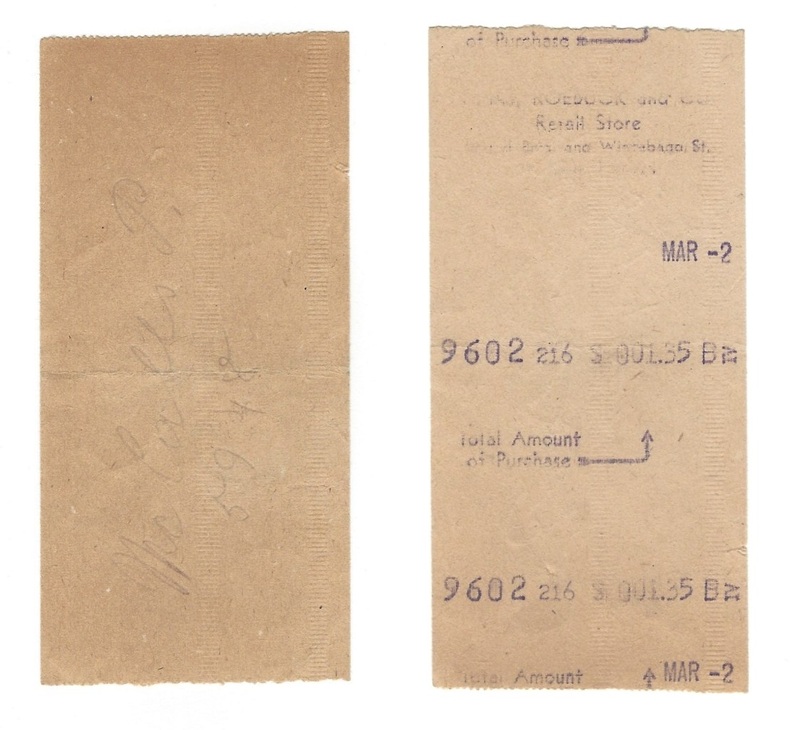 At the top of the receipt, it is a little faded, but I can still read “Sears, Roebuck and Co. retail store, Grand Blvd. and Winnebago St.” My scan didn’t pick up as much as I can see on the real receipt. There is a date of “March 2” with no year. The total amount of purchase shown comes to $1.35. At first, I talked to my mom, because she grew up not too far from that area and her mom worked in retail department stores. She remembered going with her mom to this store, where some good memories were made. Then, I looked up on my favorite preservationist and architectural appreciation web sites for our town and found this page showing pictures of the building and telling the sad story of how the Art Deco building had been neglected, unwanted, and torn down years after its closing in 1993. Now that I could place the location and store this pattern came from, I assumed it was bought in the year of the pattern, 1944, until I saw a handwritten note of “McCalls P. no. 5948” on the receipt back. Now I have done the best internet searching I can do, and I find no records, no picture, or anything of a McCall pattern by that number. 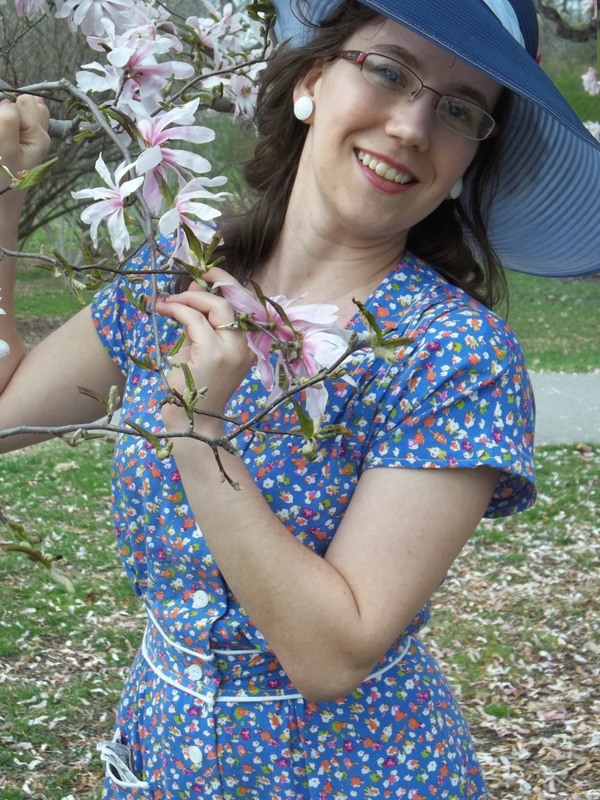 However, I do possess a pattern with a very close number, McCall #5946 (see the post of my “Daily Life Dress”), and this pattern is from the next year after my Easter dress, year 1945. This presents so many questions. Is it possible this 1944 McCall #5668 pattern was bought in 1945? Did patterns stay out for purchase years after release, or was this something that happened just during war-time due to the smaller amounts of available resources for consumers and companies alike? I know I’ve definitely noticed a boom in patterns and styles in the year 1946, so did some of these patterns which had been out to buy for most of the war get shelved at that time? What is this mystery pattern the purchaser wrote on the back of my receipt? I wonder. If anyone wants to join in with me and help me answer some of these questions, you’re most welcome. Now that I’ve addressed the “travel history” of the pattern, I’ll tell you making the pattern for my Easter dress was really pretty easy, requiring no extremely complicated skills. I merely made things harder (but a lot nicer in the end) for myself by deciding to add in the piping and extra inside waist facing. The most time consuming parts were the ones you would expect – the French seams, the piping, and the buttons and their holes down the front. Also, interfacing was ironed onto the wrong side of the front waistband, the self-facing half of the fronts (bodice halves and skirt halves), and the back facing piece. This type of iron-on interfacing (done for my 1946 Yellow Knit Top) is tricky and time-consuming but it really helps get sharply turned edges on a material as drapey as rayon challis. The dress was made exactly according to the pattern, except for one fun personal change – the chest tucks at each side of the neckline are facing out, where you can notice them, rather than the conventional inward facing. This makes them more like pin tucks, and much more decorative, than regular tucks. I figured they would also complement the angles of the square neckline I chose. Wearing a square neckline is real pleasure, too – and a nice oddity in my wardrobe. It nicely frames the face, I think, making this dress, together with the bold, bright floral fabric, not a frock for the wallflower side of me. The top half of the dress turned out more blouse-y and generous than I anticipated. Oh well, this gives me room to move my arms easily and wear some vintage figure enhancing lingerie. I did also sew in rounded, softened silhouette shoulder pads which fill in the dress’ top and nicely shapes the droopy fabric. At least, the bottom half of my dress turned out fitting snugly comfortable. 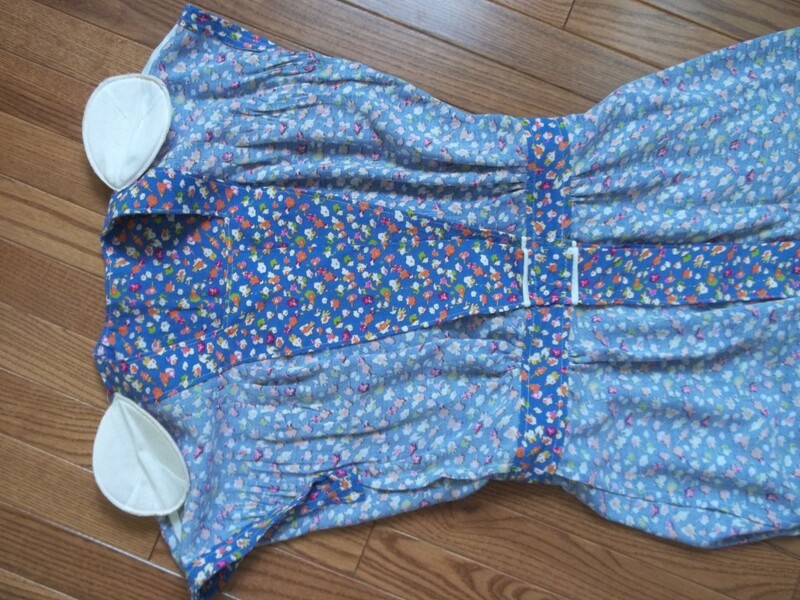 I was afraid that the skirt section would be a close fit which would end up pulling at the buttons. Whenever I see this, I imagine a button popping out at me. Not too often do I have a larger lot of vintage buttons, and I was excited to be able to use up a “baker’s dozen” of 13 shell buttons. They all are a little different in character, but that’s what makes them special. Button number 13 wasn’t actually needed by time I hemmed the dress, so it is sewn in to the bottom side seam as an extra “just-in-case” one. The waistband middle was way too thick for me to even remotely consider making a workable buttonhole there – it might break my precious special vintage “buttonholer” machine. So I just did a once around to make what looks like a buttonhole there and sewed the button directly down. There are double heavy-duty snaps to keep the waist band securely closed. When the dress is on me, no but you will know the difference. The piping really is the small addition to this dress’ design that makes the whole thing go up a notch in style. Why have a separate waistband designed in the dress and let it get lost in appearance?!? This was my first time sewing with piping, and I am relatively happy at how I did wedging it in the seams. I wasn’t sure how to even make it work, until I had the idea to use my invisible zipper foot on my 1970’s Brother sewing machine. I suppose using a zipper presser foot is a simple cheater’s way of doing something without an expensive specialty part, but, hey – it worked great! It took lots of pinning, measuring, and slow stitching to reach the point where I was happy with the piping…and I am my own worst critic. I must admit I wasn’t 100% happy with the “Wrights brand” piping tape, but I don’t really know if there is any other option out there to buy. I’m not meaning to complain, for after all, all’s well that ends well, especially when the addition of piping helped my dress turn out better than I had hoped. As a last minute “after-everything-else-is-done” decision, there is also piping added along the top opening of the pocket. Otherwise the pocket would have been lost in the rest of the dress. Never underestimate the beauty and utility of having a pocket. For Easter, I totally splurged and chose my own gift to wear with my outfit – new shoes! I did not know until a few days before Easter if my dress would be done in time, and so I decided at the last moment to order my shoes from ModCloth. They are the “Say It with Sophistication Heel in Ivory”. The employee I spoke to on the phone was extremely kind and helpful, even giving me a free “rush” 2 day delivery upgrade on my order. I was so tickled! My shoes look so high heeled, but they are really the most comfortable heels I’ve worn in a long time. 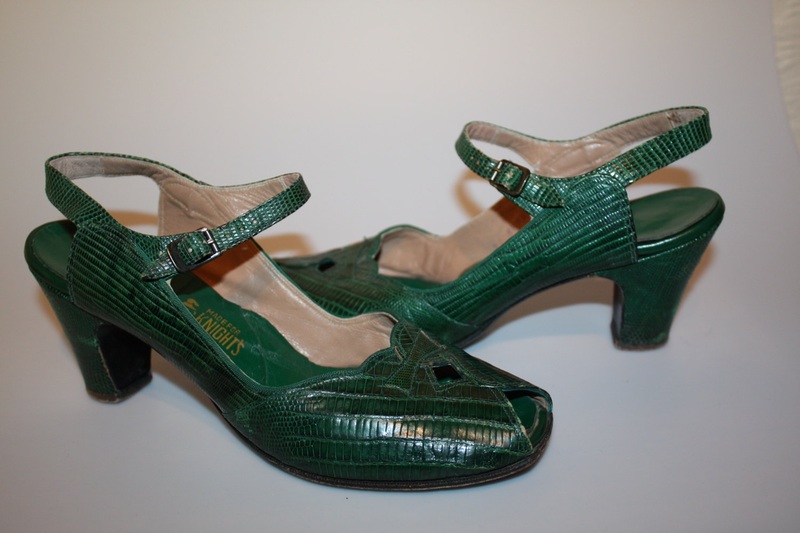 I love all of Chelsea Crew’s brand shoes and have several, but this pair is lovely – nice details and oh-so-very 1940’s. They are the perfect complement to my dress even though in reality they are a darker ivory color than I expected. I’ve seen old originals which look just like these…Chelsea Crew did a good job imitating those old beauties. By the way, the grass in our pictures really isn’t fake, just the first new grass of spring. Spring rains are necessary for such lovely grass but it made the ground mushy where I was posing. My heel sunk right into the ground and I totally felt stuck and frustrated. Pulling my heels out left me with a yucky plug of mud, ruining my “perfect Easter outfit” look. 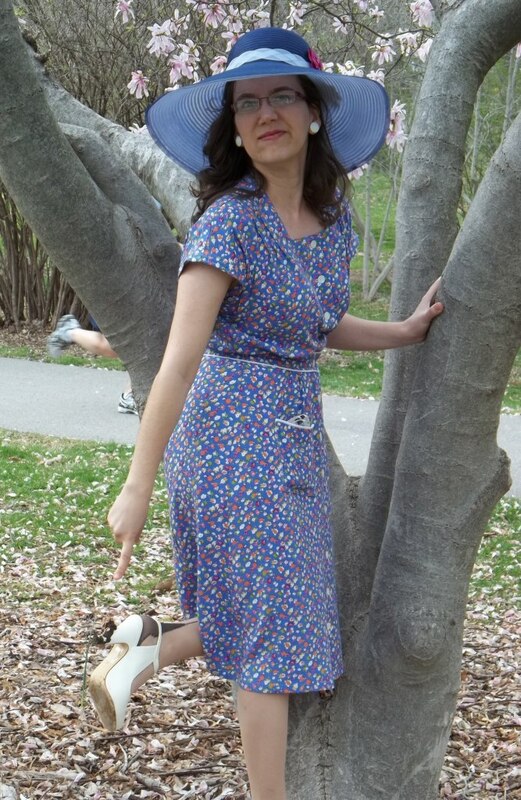 Nothing mars the prettiest Easter outfit like an ugly scowl as hubby caught in this picture. A passing man that was jogging on the trail behind me (which you can see his feet if you look by the tree) filled in the words for me, yelling out an exaggerated, “Eww, yuck!” It was quite embarrassing, funny, and totally memorable. This entry was posted in 1940's and tagged "Chelsea Crew" shoes, "McCall's pattern", "rayon challis", "Say It with Sophistication Heel", 1940's, 1944, buttons, dress, Easter dress, floral, flowered, McCall 5668, Modcloth shoes, pintucks, piping, pockets, rayon by kellycb. Bookmark the permalink. What a beautiful dress! I love that you were able to get so much information from the pattern, down to where it was originally purchased. My most special find in a pattern was a typewritten index card which describes the dress and the girl who sewed it, making it sound like she wore it to some kind of sewing fashion show! Your post is so incredibly detailed, just like your dress…. Now I’m off to read more of your blog!